Around this time last year I wrote on this blog about ‘Generation Audioboo’ and the opportunities for anyone entering the field of digital journalism. A year on, there are more free tools, and more editorial choice. Google Hangouts are now ‘On Air’ for all, for example. 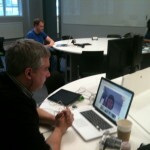 Students on the Interactive Journalism MA course at City University London have been setting up their own live events. Yesterday’s group ran a Google Hangout, themed around social media use for journalists. It was live on air; you can view it – and the class discussion below the video – here. Rob Grant, a student on the course, led the discussion with to Sarah Marshall, technology editor at Journalism.co.uk, Adam Tinworth, journalist and consultant (and a visiting lecturer at City) and Nick Petrie, social media and campaigns editor at The Times about journalism and social media in a Google+ Hangout. Rob asked the panelists how to manage social media use as a student journalist: is your presence on social media platforms your CV? “It’s not their CV but it’s part of their personal profile”, according to Sarah Marshall, who said that if she was involved in recruiting, she’d be looking closely at social media presence of potential candidates. It’s like a musician who says ‘I’ll play my guitar but only when I’ve got a recording contract’. I don’t buy that you’ve got a passion for this job if you don’t show an inclination to do it when the tools are available freely. If we hadn’t started [Wannabe Hacks] I wouldn’t have [had] a job offer from the Guardian because they were looking to build niche communities around certain verticals like education and volunteering and social enterprise. If we hadn’t just spent three or four months building a niche community around wannabe journalists I wouldn’t have had any experience of that nature … and to demonstrate my skillbase. The other group have set up a community journalism themed meetup, ‘Meet the Managers’, in Islington on Wednesday 13 March 2013, also featuring Nick Petrie, along with Hannah Waldram, community coordinator at the Guardian, Sarah Drinkwater, who runs a team of community managers at Google and Tom Phillips, international editor at MSN. Places are free but are already being booked up fast, so if you’re interested, sign up here. Judith Townend is a journalist, researcher and visiting lecturer at City University London (@jtownend on Twitter). This entry was posted in SEO, social media, twitter and tagged city university london, google hangout, interactive journalism, meet the managers meetup on March 1, 2013 by Paul Bradshaw.